A Lagrangian point is a location in space around a rotating two-body system (such as the Earth-Moon or Earth-Sun) where the pulls of the gravitating bodies combine to form a point at which a third body of negligible mass would be stationary relative to the two bodies. Lagrangian points are named after the Italian-born French mathematician and astronomer Joseph Louis de Lagrange who first showed their existence. There are five Lagrangian points in all, three of which are unstable because the slightest disturbance to any object located at one of them causes the object to drift away permanently. Until recently, this meant that the unstable Lagrangian points seemed to have no practical application for spaceflight. Now, however, they are known to have immense significance and have become the basis for chaotic control. In addition, growing numbers of spacecraft are being placed in halo orbits around the L1 and L2 points; station-keeping, in the form of regular thruster firings, are needed to maintain these orbits (which are around empty points in space!). The NASA Sun-observing probes SOHO and ACE currently orbit around L1, while future spacecraft to be placed in L2 halo orbits include the Next Generation Space Telescope and the European Space Agency's Herschel, GAIA, and Darwin spacecraft. In many ways these points are ideal for observing both near and far reaches of space since spacecraft can orbit around them far from disturbing influences, such as that of Earth's magnetosphere. L1 is well-suited to solar observations; L2 offers uninterrupted observations of deep space, since the spacecraft can be oriented so that the Earth, Moon and Sun remain "behind" it at all times, and enables the entire celestial sphere to be observed over the course of one year. L3 hasn't been utilized for spaceflight because it lies on the opposite side of the Sun from Earth. 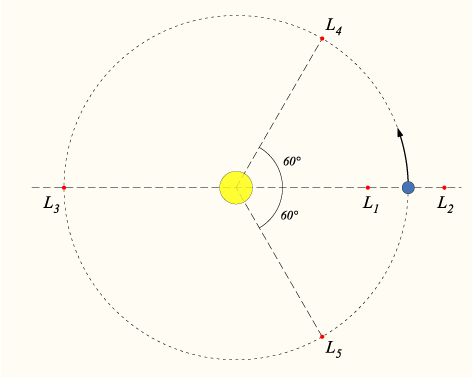 The remaining two Lagrangian points, L4 and L5, lie at the vertices of equilateral triangles formed with the two main gravitating masses and in their orbital plane. They are also referred to as libration points since if any objects located at them are disturbed, the objects simply wobble back and forth, or librate. It has been argued that the L4 and L5 points in the Earth-Moon system would be ideal places to locate space colonies.